Bella Care Hospice with the help of The Celebrate Life Foundation has made many patient dreams come true. The dreams can be simple to complex. The foundation has helped to facilitate patients meeting Steven Tyler from Aerosmith, or attending batting practice with the Cleveland Indians. Other patients just want to be reunited with a family member or have a special meal. The foundation has helped to improve quality of life for patients and families by providing essentials such as air-conditioning or even basics needs like clothes or shoes. Mary turned 100 years old while on Bella Care Hospice. 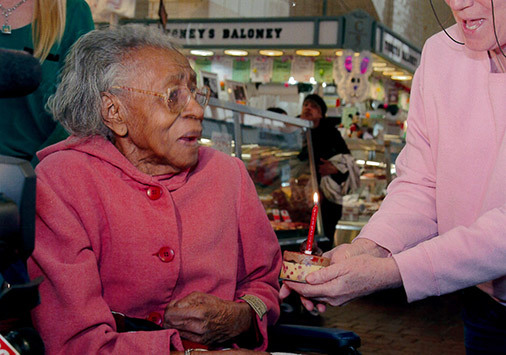 One of Mary's favorite childhood memories was visiting the West Side Market. She loved to look at all the different cakes, pastries, and flowers. Bella Care Hospice with the support of The Celebrate Life Foundation was able to arrange a special trip to the West Side Market. Mary received special attention from vendors and patrons. The Mayor of Cleveland presented her with a proclamation declaring her birthday, Mrs. Mary Jones Day in Cleveland. Viola Haley a patient on Bella Care Hospice had a special request. She had not had a professional photo of her and her daughter, Mary, taken in over twenty years. Her daughter who has special needs was rarely able to visit her mother. Viola expressed sadness about how much she missed just seeing her daughter, and wanted an updated picture of the two of them. Bella Care Hospice with the help of The Celebrate Life Foundation were able to arrange for Mary to come to the nursing facility and have a professional photo shoot done. After the visit Viola felt more at peace, and would show everyone who cam in to her room her beautiful daughter. Both mother and daughter cried and hugged each other and were beyond thankful for this simple gift. Bella Care Hospice of Dayton helped to fulfill a lifelong dream of patient, Rita Glaser. Rita a Woman's Army Core Veteran from WWII was able to be a passenger on the Honor Flight. The Honor Flight is a way to honor America's Veterans for all their sacrifices. 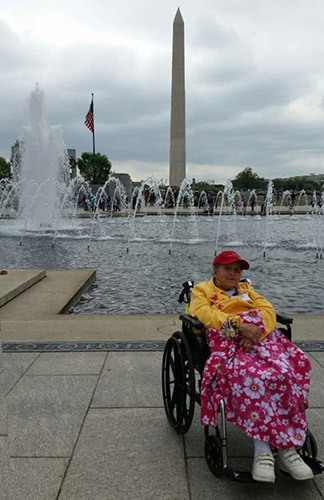 Rita was flown to Washington D.C. to visit and reflect at all the memorials.